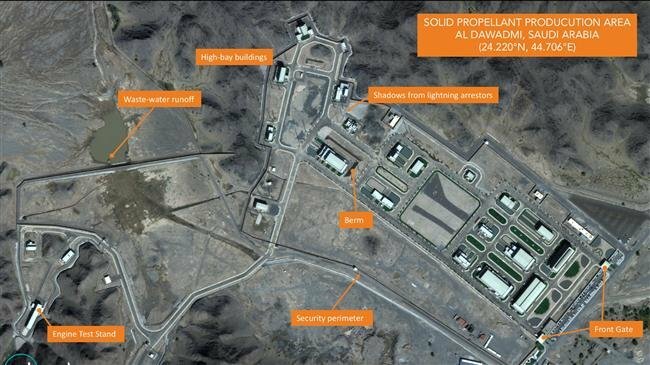 Saudi Arabia, already known as the world’s top importer of foreign-made ballistic missiles, has started building its first missile production factory near the central town of Al-Watah, The Washington Post has quoted experts as saying. In a Wednesday report, The Post quoted leading experts as saying that satellite imagery dating back to November appears to show Saudi Arabia’s debut ballistic missile factory located at an existing missile base near Al-Watah. This would reportedly be the first known instance of Saudis manufacturing the weapons indigenously, after importing foreign-made ballistic missiles for years. The photos were discovered by Jeffrey Lewis, a nuclear weapons expert at the Middlebury Institute of International Studies at Monterey and founder of the Arms Control Wonk blog, and his team. 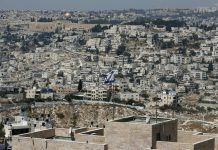 The findings were further confirmed by Michael Elleman of the London-based International Institute for Strategic Studies and Joseph Bermudez of the Washington-based Center for Strategic and International Studies. Media reports of a Saudi ballistic missile base in Al-Watah first surfaced in the form of an article published in July 2013 by IHS Jane’s Defense Weekly. The site revealed satellite imagery that appeared to show surface-to-surface missile sites being constructed to accommodate the deployment of Chinese Dongfeng DF-3A intermediate-range ballistic missiles, purchased in the 1980s during the war Iraqi dictator Saddam Hussein imposed on Iran. Saudi Arabia publicly unveiled its DF-3A arsenal for the first time during a military parade in April 2014. That same year, Newsweek reported that the CIA helped facilitate a secret deal to allow Saudi Arabia to buy improved Chinese DF-21 missiles in 2007. Last year, the Saudi foreign minister threatened that the kingdom will make nuclear bombs if the Islamic Republic of Iran moves to develop an atomic weapons program. “We have made it very clear that if Iran acquires a nuclear capability we will do everything we can to do the same,” Saudi Arabia’s former Foreign Minister Adel al-Jubeir said in May 2018. Meanwhile, there are reports that Riyadh is buying information from the Israeli regime that would allow it to develop nuclear weapons, a senior Israeli nuclear expert revealed last year. Ami Dor-On, a senior nuclear commentator with the Israeli military organization iHLS, said in May 2018 the cooperation has been made possible in the wake of the widening ties between Saudi Crown Prince Mohammad bin Salman and Israeli Prime Minister Benjamin Netanyahu, and is indicative of an emerging nuclear arms race in the region. Saudi Arabia has already asked the US for permission to expand its nuclear program to include uranium enrichment, a move that experts warn is not to be taken lightly considering the Riyadh regime’s never-ending thirst for political and military dominance in the region. The kingdom is widely viewed as the financier of Pakistan’s nuclear program. Ironically, Saudi royals took the first steps in the 1970s after finding out that Israel and India had already taken major steps towards developing nuclear weapons. A few years after jump-starting Pakistan’s weapons program, Saudis followed their own nuclear ambitions by secretly procuring Chinese ballistic missiles already capable of delivering nuclear payloads.